The 2013-14 season is just about upon us, and we’re headed for another year of the two-headed monster in net. I want to preface what you’re about to read with a disclaimer that in no way do I think that either goalie that Miami currently has under scholarship is not good enough to be in a nubmer 1 goaltender position. But there is certainly a large part of me that would like to see either or both of these guys get their full-on shot at the #1 goalie spot for the Miami RedHawks. 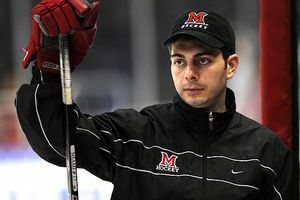 In the last several years, Head Coach Enrico Blasi has employed the 2-goalie rotation. One of the two stellar goalies plays on Friday night, and the second will play on Saturday. Currently, that rotation is composed of Ryan McKay and Jay Williams. But what if things were different in Oxford? What if Enrico Blasi goes with an established top guy and has a trusted backup? We explore the topic as we prepare for the season that starts tonight. Brandon Crawford-West left school early, putting Miami in a situation to start the two-headed monster. During the 2004-05 campaign, then-sophomore Brandon Crawford-West was the last clear-cut Number 1 goalie for the RedHawks. He played in 32 games, had a save % of .917 and allowed a fairly stingy 2.48 GAA for a team that went 15-18-5. It would be the last time Miami didn’t make the NCAA tournament before starting their current streak of 8 tournament appearances in a row. Crawford-West knew that Charlie Effinger was waiting in the wings, having posted a 4-2-0 record in 6 starts with 3 additional relief appearances. Crawford-West would then leave Miami after that sophomore campaign, and according to hockeydb.com, has not played any type of major hockey since. During the offseason, Blasi would recruit and bring 6’2″ Jeff Zatkoff in to play between the pipes as his backup goalie. Only it didn’t turn out that way. Zatkoff actually played 4 of the first 5 games in 2005-06 (including the season-opening exhibition against Windsor) and won 3 of those 4. It seemed like Zatkoff was poised to be the #1 goalie, but would end up splitting games with Effinger. Zatkoff went 14-5-1 in 20 games and Effinger went 12-4-3 in 19 games. The two would rotate for the rest of their time in Oxford until Effinger graduated in 2008, at which time also Zatkoff left Miami. He left with 1 year of eligibility remaining, and headed to the professional ranks. On a side note, Zatkoff is likely to get his first NHL game action this weekend, as the Pittsburgh Penguins play back-to-back games for the first time this season. Connor Knapp was part of the two-headed monster for Miami’s 2 Frozen Four appearances. Connor Knapp and Cody Reichard were the two-headed monster from the 2008-09 season through the 2011-12 season. Having used Zatkoff and Effinger on a rotating basis, Blasi made no qualms about his rotation strategy, and rotated these two for their entire 4 years. Williams and McKay have continued that trend once again, having played their freshman season as a quite-potent 1-2 punch in Oxford. Along the way, Coach Blasi has maintained that whomever plays best in practice during the week will play on Friday night, and the Saturday goalie will be determined based on the Friday night performance. In addition, Blasi is frequently quoted as saying that the two goalies are always good friends and truly push each other to be better in practice. But how far can that get you? In the 2008-09 season, Cody Reichard got hot at the end of the season and became the top goalie. He played in all 4 tournament games including the National Championship game against Boston University. He allowed just four goals and made 65 saves during the NCAA Regional in Minneapolis and during 21 period stretch ending with the 2 regional games, only allowed 12 goals. With a vote of confidence earlier in the season and being named “the guy”, I wonder what happens differently late National Championship game. Jump into the 2009 season, and the roles were reversed. Reichard was benched late in the season in favor of Connor Knapp. I’m not saying Knapp definitely gets us past Boston College in the Frozen Four/National Semifinal instead of getting pulled for Reichard in the 2nd period. But who knows? Reichard’s career: 92 starts and 53 wins; Named CCHA Player of the Year and a first-team All-CCHA selection in 2009-10 going 15-5-2. 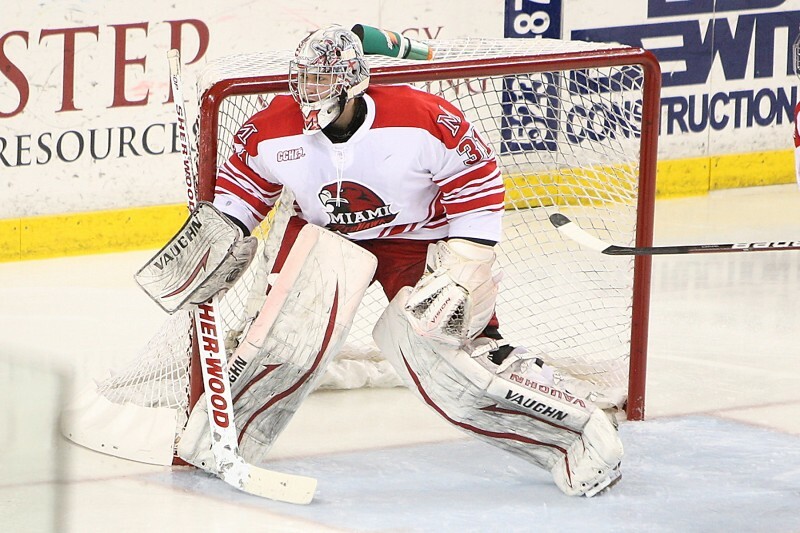 Knapp: 84 starts and 46 career wins; 2010-11 CCHA Best Goaltender Award finishing with a 15-8-0 record, including 12 wins in his final 16 starts, allowing a goal or less in 13 of his final 17 appearance. Let’s say that Reichard gets half of Knapp’s starts and keeps the same 57.6 win percentage, that extrapolates to 77 career wins in 134 games. If Knapp gets half of Reichard’s? 130 starts and 71 wins. Staggering numbers while one is the main guy and another is the backup. Fast forward to 2012-13 when Ryan McKay and Jay Williams split time in net. Williams was 12-5-1 in 21 games and was 13-7-2 in 23 games. Jay Williams filled in for McKay at the start of the season while McKay was injured. Later, it was McKay who went on an unbelievable streak and ended up starting 13 of the last 15 games in net. Does that mean McKay will be the #1 guy come Friday night? I’m only one guy, and Enrico Blasi is one of the best coaches in the NCAA. He has a Spencer Penrose award for the best coach in all of Division 1 hockey, 8 straight and 9 total NCAA tournament appearances, 2 Frozen Fours, 2 CCHA Regular Season Championships, 1 CCHA Tournament Championship and 5 CCHA Coach of the Year awards. You can’t argue with his resume. I just think there’s an opportunity awaiting him this season when it comes to that two-headed monster in net. Here’s my plan for success this year, and into the future. Ryan McKay starts as the top guy and plays the majority of the big games, including against teams such as Ohio State (2 games this year), North Dakota (4), St. Cloud State (4), and Wisconsin (2). Williams – by no means what you could call a “backup goalie” – can play the lesser foes such as Canisius, UNO, WMU, and the like. This allows that number one guy to be established. Blasi isn’t the type to encourage anyone to leave Miami early, but let’s say McKay leads the NCAA in GAA and Save % again, the leaves school early for the pros. This creates an ideal situation, and here’s why. Williams, now a sophomore, will have his time for the next 2 years as a Junior and Senior. At the same time, Blasi is forced to recruit and bring in a goaltender, who is Williams’ protege and backup for 2 years. Barring any other early departures or injuries, at the very least, this gives Miami a succession plan as far as goalies go. Turn no further than the season-opening exhibition against Windsor last Saturday night, and you’ll have your answer to the question of “what’s Rico’s goalie plan?” The RedHawks won, with Jay WIlliams getting the start, and Ryan McKay relieving him halfway through the game. Both looked good, although 2 turnovers cost Miami 2 goals in 10 seconds in the third period against McKay. While it has yet to come up during Blasi’s weekly press conferences, I’m sure you’ll hear the same refrain when asked this season. The two-headed monster returns to action tonight as Miami takes on Ohio State in the regular season opener, and returns to Oxford on Saturday against the same Buckeyes. Enjoy the games, and be sure to follow us on Twitter at @MiamiHockeyBlog for updates. Coming off of a weekend sweep in Oxford, the RedHawks look ahead to another (!?!?!) home series against Alaska to start off what looks to be a rugged February schedule. Miami hadn’t been at home for a game in 48 days before Friday night, and after the upcoming weekend will have played 4 home games in 9 days. Follow that up with the Western Michigan Broncos in Kalamazoo and Notre Dame on Friday 2/15 and Sunday in Chicago on 2/17, and Miami’s strength of schedule and RPI should be rising quickly. Here’s what you missed over the last week. Ahh Alaska. The Last Frontier. The place where it’s 86 degrees cooler than Oxford, Ohio today. Also the school furthest from civilization Oxford and all other teams in the NCAA (other than Anchorage, of course and maybe Hawaii). Miami left home on Wednesday, didn’t get there until Thursday (3:00am, anyway) and takes on an Alaska squad that took NMU to overtime twice last weekend in Marquette and only took 1 point out of it. 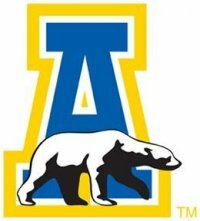 The Nanooks come in at 6-5-3 on the season, and 4-4-2 in the CCHA. They are only 2 points behind Miami at the top of the standings and are doing something that Miami has prided itself on in seasons past – staying balanced. Alaska has 4 players tied at the top of their scoring charts – 2 seniors, and to underclassmen. Not surprising to see at the top of the list is Senior Andy Taranto. I feel like he’s a guy we’ve been seeing with the Nanooks for about 17 years. 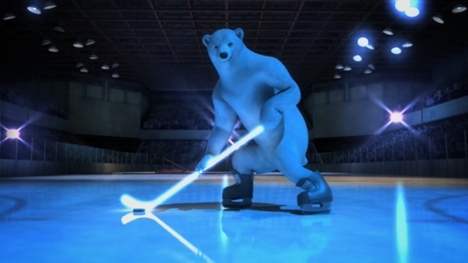 In net, Freshman John Keeney has played 6 of the 14 games, and 3 goalies have seen significant time for the Polar Bears. Keeney is 2-2-2 with a 1.79 GAA and .935 save percentage – by far the best on the team for both. Senior Steve Thompson has played in 4 games this season and took home the October 22 CCHA Goalie of the week, but is struggling with just a 2-2 record, 3.24 GAA and .876 save percentage. Thompson only played in 3 games before this season, all coming last year, and Sophomore Sean Cahill played once last season, both getting mop-up duties while Senior Scott Greenham took ice time all season. It’s anyone’s guess who we’re going to see this weekend, but I’d suspect we see a lot of Keeney, as he has been the hot hand. 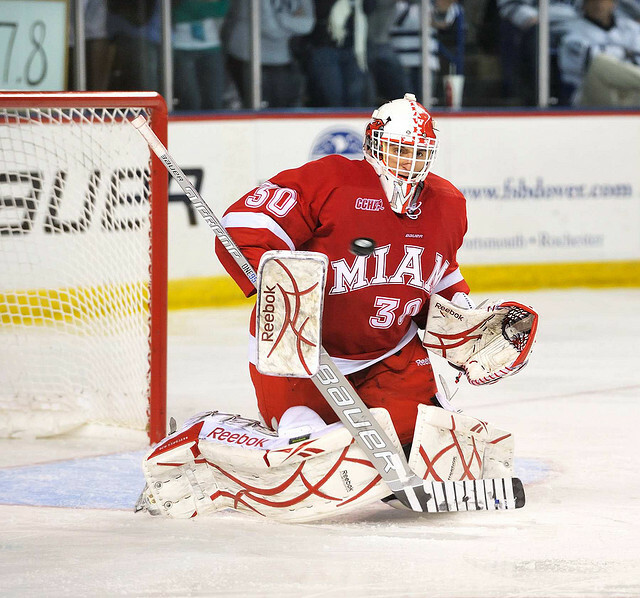 For Miami, Enrico Blasi continues his run to 300, and stands at 293 wins on his career. Miami has a 36-14-5 edge against Alaska and despite the 18+ hours of travel to get there every time, is still a surprising 16-7-3 in Fairbanks. Leading the scoring for Miami is Riley Barber, but Sophomore Alex Wideman has been absolutely on fire the last few games. As we mentioned in our 2-week “Turkey Day hangover” recap, Wideman has goals in his last 3 games, has 4G and 3A in 6 total games, and has also scored the game winner in each of the 2 of Miami’s shootouts in which he has participated. Look for more from Wideman, and let’s hope Miami scores first. Miami is 6-1-1 this season when doing so, and 6-0-0 when scoring thrice. I’m confident Miami brings home 6 points this weekend behind Jay Williams continued strong goaltending (and perhaps we see Ryan McKay return as well?). Another week, another Michigan team for the RedHawks to play. This week will mark the 4th straight week that Miami has played a team from Michigan, this time welcoming the Michigan State Spartans to Steve Cady Arena. As we scout the unranked Spartans, the first thing we notice is that they just beat Michigan 7-2 last Saturday night. In fact, Sparty has won their last 3 Saturday night games and lost each of those series’ 3 Friday night games. Not only that, but they have outscored their opponents 17-5 in those Saturday games. Each of these series has been against CCHA teams, and Michigan State stands in a tie for third in the logjammed CCHA standings at the start of the week (ND beat Michigan Thursday night to jump to the top of the CCHA and push Miami to 2nd and MSU to 4th currently). Michigan State will be led by Sophomore Matt Berry, who currently stands 4th in CCHA scoring with 6 goals and 5 assists (behind RedHawks Riley Barber, 14pts and Austin Czarnik, 13 pts). Berry had a hat trick in the 7-2 victory over Michigan and looks to lead the Spartans over another ranked CCHA foe. Anastos, the former CCHA Commissioner, seems a bit unsettled on his goalie situation at the moment. Junior Will Yanakeff has played in 7 games, compiling just a 2-4-1 record and is allowing 3.71 goals per contest. 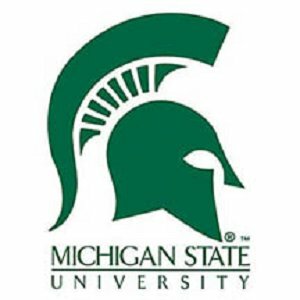 Freshman Jake Hildebrand was in net for MSU’s big win against Michigan, and is 2-1 on the season, and has only allowed 1.8 goals in his 4 games played. Jay Williams has performed fantastically while McKay has been nursing some sort of groin or leg injury, and we’ll likely see the rotation kick back up again now that he’s healthy. McKay sports a 1-0-1 record with the tie being a shootout win against Providence. After that shootout win, McKay started the Friday night game at Michigan and that is when he quickly came out of the game. Just 5 minutes in, McKay injured himself, came out of the game, and even went into the locker room for a stretch. He was the only other goaltender dressed that night, so he did come back on the bench and was also the only goalie dressed for the other 5 games Miami has played (2 at Ferris and 2 at home against NMU) as well. In any event, it will be nice to see this freshman back on the ice and fighting off the frozen rubber again. We like repeating it, so we’ll fill you in on the leading scorer in the CCHA – Miami’s Riley Barber. Barber leads all scorers as a rookie with 14 points and Austin Czarnik is just one point behind him. Czarnik leads the RedHawks with 6 goals and leads the country with 3 shorthanded goals. The new “super duo” as coined by CBS College Sports’ Dave Starman will look to continue their hot play this weekend. As we mentioned in last week’s wrap up, the Hawks will need to stay out of the box this week. 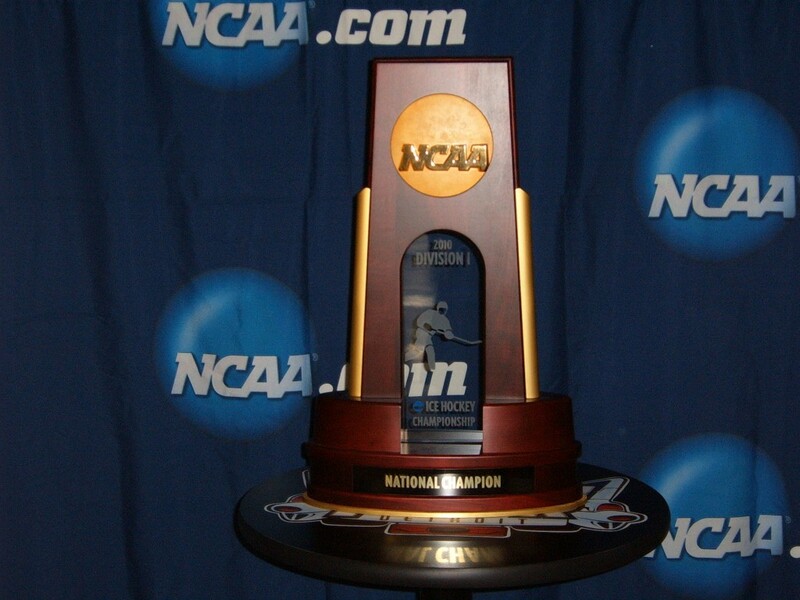 Michigan State clearly has the ability to put the puck in the net, it’s a matter of when (Friday or Saturday?). MSU is scoring on 25% (11 of 44) of their power plays and Miami will need to make sure they aren’t caught in the box for a sudden outpouring of goals like MSU had against Michigan last Saturday. As we wind down towards puck drop, I can’t help but think Miami is going to sweep the weekend and the boys will again sit atop the CCHA standings after 4 weeks of CCHA play. 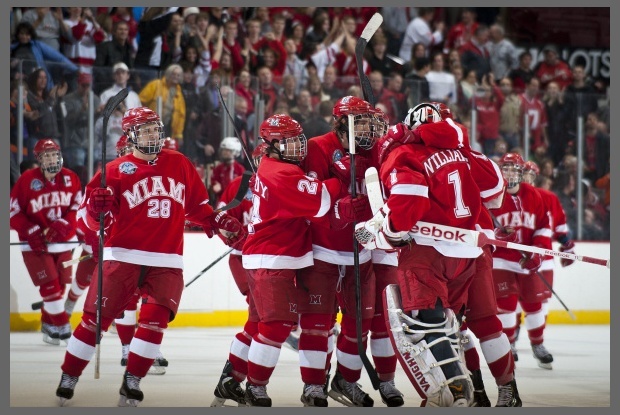 Miami has owned Michigan State of late, having won the last 5 contests including 2 CCHA tournament games last season. Overall, Miami is 31-68-5 against MSU and Coach Blasi looks to improve his record above .500 as he is currently 19-20-0 against the Spartans. Miami is 4-0-2 at home this season, and 2-2 when allowing 3 or more goals. Team defense will again be the name of the game to keep MSU off the scoreboard. While 5 points is nice, 6 points is nicer. 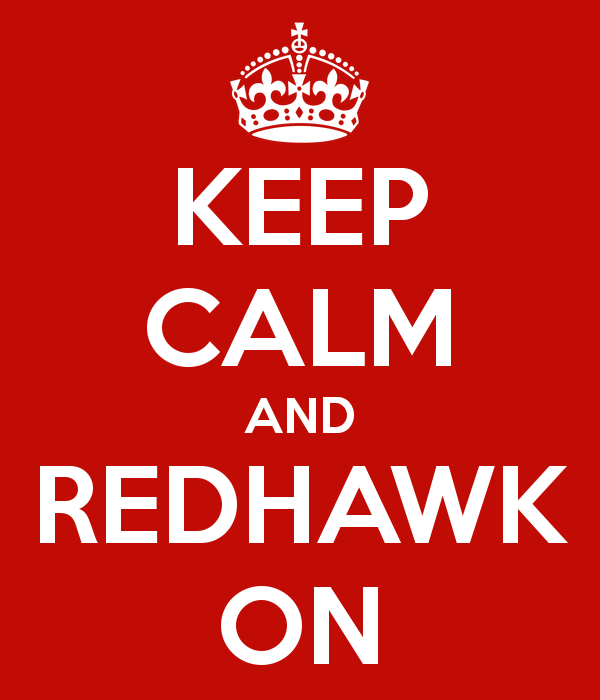 Let’s get a sweep, RedHawks! See you at the game on Saturday night!